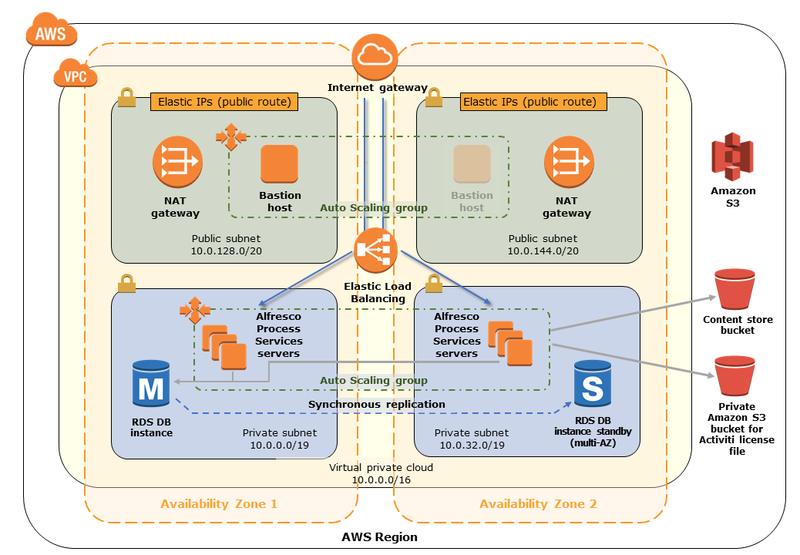 Use this Quick Start to deploy an Alfresco Process Services server cluster on the AWS Cloud. Alfresco Process Services is an Enterprise Business Process Management system that many organizations use to automate and drive business operations such as client onboarding, investment services, patient care pathway, and case management. The flexible compute, storage, and database services that AWS offers make it an ideal platform for Alfresco Process Services. This Quick Start presents an enterprise-grade Alfresco Process Services configuration that you can adapt to virtually any scenario, and scale up, down, or out, depending on your use case. The Quick Start includes AWS CloudFormation templates that deploy Alfresco Process Services automatically into a highly available, secure AWS Cloud environment. In the private subnets, an Alfresco Process Services instance in an Auto Scaling group to add or remove highly available process services. Additionally, Amazon Relational Database Service (Amazon RDS) is configured for high availability. Amazon Simple Storage Service (Amazon S3), which provides shared file storage for the cluster. Request a trial license, upload the license to an S3 bucket, and note its URL. Subscribe to the Alfresco Process Services AMI in the AWS Marketplace. To customize your deployment, you can choose different instance types for your resources, configure your cluster nodes, and adjust storage settings. This deployment launches Alfresco Process Services automatically into a configuration of your choice. You are responsible for acquiring a trial license from Alfresco Software. Or, if you have a valid subscription to Alfresco Process Services, you can use that license, subject to complying with standard licensing terms. Additional pricing, terms, and conditions may apply. There is no additional cost for using the Quick Start, but you are responsible for the cost of the AWS services used while running this Quick Start reference deployment. Prices are subject to change. See the pricing pages for each AWS service you will be using for full details.